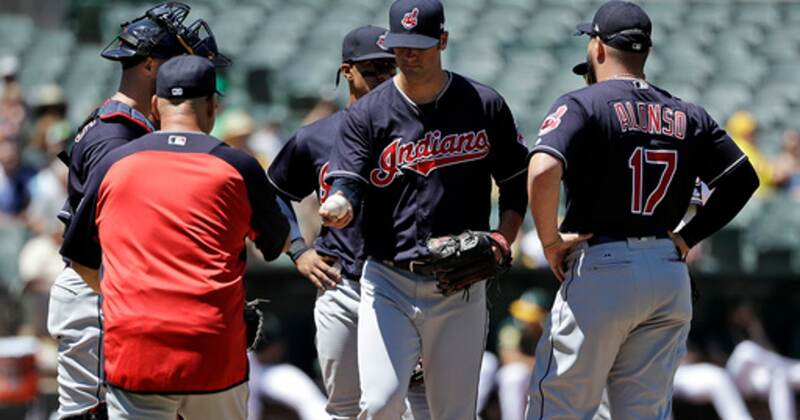 OAKLAND, Calif. (AP) Journeyman Edwin Jackson earned his first win with Oakland, pitching neatly into the seventh inning as the Athletics beat the Cleveland Indians 7-2 Saturday for their season-high sixth straight victory. Jackson (1-0), who signed a minor league contract with the A’s on June 6 and is now with his record-tying 13th major league team, gave up only two hits in 6 2/3 innings. He struck out six and walked none in his second start for Oakland. The 34-year-old righty has won 10 consecutive decisions over Cleveland, a streak dating to 2008. His streak against the Indians is the longest since Charlie Hough beat them 13 straight times from 1984-88. Indians: LHP Tyler Olson (latissimus dorsi strain) threw his first bullpen on Friday and is expected to throw off a mound again on Sunday. . LHP Ryan Merritt (left knee sprain) threw 48 pitches on Friday in a rehab game with Triple-A Columbus. . RHP Carlos Carrasco (right elbow contusion) was expected to throw 65 pitches in a rehab game with Double-A Akron on Saturday. Athletics: 3B Matt Chapman (right thumb contusion) will take BP on Sunday and could be activated for Tuesday’s series opener against San Diego without going on a rehab assignment. ”Even if we don’t feel like potentially he’s up to speed offensively, he can save some runs out there defensively,” manager Bob Melvin said.